Since my last post, in addition to baking the bread for this post, I have completed two pilgrimages. The first, crossing off an item on my Bucket List, was to Mile 0 on US 1 in Key West. The second was to Kingston, Ohio to visit the home of Ben’s Sweet and Hot Mustard, an absolute favorite of mine. I went with my brother-in-law Stan, and we got to meet Karen, the wonderful woman behind Ben's Mustard, who gave us a tour of her whole operation. Beginning about 20 years ago Karen began perfecting her mustard recipe for friends and family. It took her five years to get it he way she wanted it. It became so popular that about seven years ago she began selling it, first cooking it in kettles on the stove, then adding turkey fryers on the back porch for more capacity. She has since upgraded to a 40 gallon steam kettle, but still makes every batch by hand. It was a joy to meet someone so excited and passionate about what she is doing. 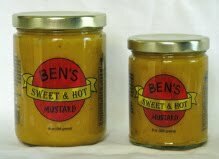 Ben's Mustard is available online by clicking on Shop Ben’s Sweet and Hot Mustard, and is definitely worth a taste. It is great on or in anything (and I have been known to just eat it with a spoon). Despite these journeys I did bake the bread for this assignment, which was gluten-free. Why gluten-free? According to Gluten intolerance becoming more commonplace, surveys suggest that 1 out of every 133 people in the general population is gluten intolerant. (This is as compared to the incidence of redheads, of which I have 2, which is about 3 out of every 100.) The frequency of gluten intolerance seems to be on the rise, but it is not clear whether this is actually due to increasing incidence, or is due to better diagnosis, or even, in some cases, is just due to infatuation with a fad. Whatever the case, gluten-free certainly is a hot topic. If you search Amazon.com for "gluten free" in Books you get 1010 results and in Grocery you get 3574. People who cannot eat gluten suffer from Celiac disease. This is not an allergy. According to Google Health, "Celiac disease is an inherited, autoimmune disease in which the lining of the small intestine is damaged from eating gluten and other proteins found in wheat, barley, rye, and possibly oats." Individuals with Celiac disease are unable to completely digest gluten and should not eat it, ever, for the rest of their lives. That is tough, because gluten is in lots of stuff. We all know, from watching Alton Brown, that gluten acts as a kind of net which gives the dough the elasticity to expand as the yeast produces carbon dioxide. Without the gluten, something has to replace it. As noted at Wheat-Free Gluten-Free Baking "In bread, gluten is the protein that holds the ingredients together and traps the air, allowing bread to rise. In wheat-free, gluten-free cooking and baking, it is often necessary to add one additional ingredient to every adapted recipe: a binding agent to serve as a gluten replacement." The recipe du jour calls for xanthan gum, which has prompted a fair amount of discussion in the HB in 5 Group regarding substitutions. According to About.com: Gluten-free Cooking "Xanthan (ZAN thun) gum and guar (gwar) gum are used in gluten-free cooking to bind, thicken and emulsify gluten-free ingredients. If you don't add one of these gums to most of your gluten-free baked goods, they will likely end up as a pile of crumbs!" There are other substitutions you can make, look online for ideas if you are interested. About,com notes that "Guar gum comes from the seed of bean-like (legume) plant, sometimes referred to as the Indian tree. It is high in soluble fiber. 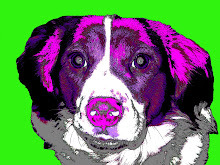 According to Bob's Red Mill Guar Gum product literature "Guar Gum has eight times the thickening power as cornstarch." Like xanthan gum, measure carefully when using guar gum in gluten-free recipes or you may end up with heavy, stringy baked goods." In the category of a bit too much information, About.com offers that "Guar gum is a high fiber product and has been associated with gastrointestinal upset in some people." At least where I shop guar gum is about half the price of xanthan gum, so I used it instead. About.com suggested using the same amount of either xanthan or guar gum in recipes, so I made a straight substitution. The other substitution I made was to use egg substitute rather than eggs. 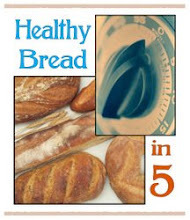 To avoid gluten this bread uses a variety of flour instead of wheat flour: brown rice, soy, tapioca, and corn starch. I found this dough messy to make. The flours were very fine and tended to get all over everything. (Clearly the fault of the flour and not the fault of the baker.) The dough was wet and sticky and more like a cookie dough than a bread dough. I first made the pizza. I rolled it on parchment paper, using quite a bit of brown rice flour, and it was very easy to roll thin since without the gluten it did not try to spring back as I rolled it. I pre-baked the crust for 5 minutes, then topped it, slid it off the parchment paper, and cooked it directly on the baking stone for another 8 minutes. It turned out looking great. I did not tell my testers what kind of dough I had used until after they had inhaled the first pieces. None of them would have guessed, see Gluten-Friend or foe? for confirmation, and some preferred this dough for its thinness. I thought the pizza was very good, and somewhat to my surprise, I really enjoyed the olives (which only went on half of one of the pizzas in deference to the tastes of my testers). Next I made the regular loaf. I formed it just using my wet hands, as the recipe suggested, but I think the dough was waaay too wet. I used my trusty 2x2s, and kept it more or less in shape. It baked up fine, and it tasted pretty good too, though not as good as the whole wheat breads. It was particularly good toasted, with some of Michelle's Carrot Cake Jam. I did notice that the bread kind of glistened. The inside of the holes in the crumb were shiny. I do not know if this was due to the gum or one of the flours. I also made the Sesame Baguette. Having gone to school on the previous loaf, I used brown rice flour to form the dough, but it was still very wet and very soft. I had a had time moving the formed loaves to the cookie sheet without having them get all wonky, as you can see. But I thought the bread was very good,with a nice flavor, perhaps due in part to the sesame seeds. Finally, since I had some dough left, I made another pizza, this one on the grill. Instead of tomato sauce, I followed the advice of Karen and used some Ben’s Sweet and Hot Mustard. It was awesome! So, in sum, I found this dough kind of hard to work with, but was pleasantly surprised with the results. It is certainly worth making if you or someone you know needs to eat gluten-free. Your pizza looks fantastic! I've tried making the epicurious recipe for gf crust, and it was very soft and bready. I'll have to try the pizza here yet! Thank you for such an interesting post! I was eager to keep reading, to see what kind of success you had. I am very interested in the sources of our food. The corn-issue makes me cringe. Have you seen that corn documentary? I can't think of what is is called right now, but you could probably look it up. It's all about how corn is grown and used in this country. Mighty scary stuff. Thank you for the lesson on gluten free. It is not something I know anything about not having anyone in my family that requires such a diet. Your breads and pizza do look wonderful! Dang...I had planned on making a pizza but then opted to first test out the dough with a simple loaf. I thought it would make a good pizza too. Glad you enjoyed this bread as I thought it was just fine and especially good toasted with lots of butter! Thanks for all the gluten free info and I am so glad no one in my family has this problem! Glad you like the Carrot Cake Jam. We enjoyed it too albeit it was on the sweet side but that's how jam is which is why I prefer to make butters instead. Can't wait to try the mustard! I do enjoy reading your posts, I always learn so much! Thank you. I will keep my options open when I make this dough and plan to remember that the dough is sticky, but worth it and great for pizza! Great job! I haven't gotten to the gluten-free bread yet, but I'm looking forward to it. Always interesting reading your posts. I really want to thank you for all the research into this one! It was fabulous to read, interesting and in-depth! Great job on all the variations! All of them look very tasty! I bowed out of this assignment but if I can find the cheaper guar gum, I might give it a go. You did a great job and your post was very educational. Great results! Your breads looked great. Congrats on making it to Mile Marker 0. My partner and I go there every year. Key West is such a unique place.